Tech marketers have an especially tough job. Sure, all marketers face difficult challenges daily, but the tumultuous nature of the technology industry introduces a whole new layer of complexity to the marketing mix. After all, the technology industry is growing and changing so fast that no one can possibly keep up. No one, of course, except for the tech marketer, whose job it is to not only keep up with the changes, but stay ahead of them. 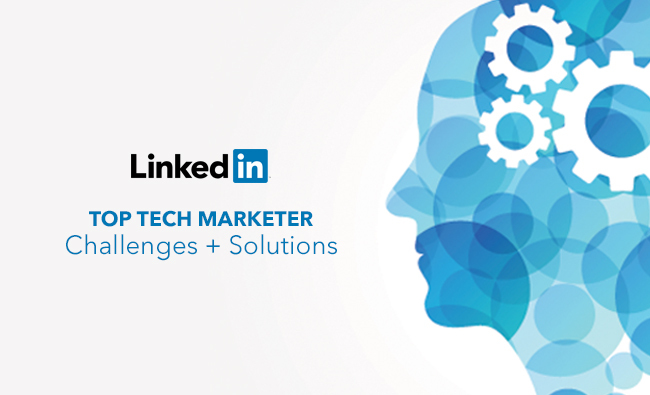 In part one of this two-part series, we’ll discuss the first two top challenges we’re seeing tech marketers face today, and offer some concrete solutions to start tackling them. Challenge #1: Who is the decision maker? Arguably the most important principle of both sales and marketing is knowing the decision maker. Without this information, it’s difficult to build a successful marketing strategy that will engage them and win them over. In marketing to tech buyers, however, the decision maker isn’t just one person. Instead, it’s likely to be a cross-functional group that might include an IT professional, a product marketer, a developer, someone in sales and, in the case of some startups, one of the company’s major investors. Get to know the key players. We all know the importance of developing buyer personas and developing a thorough understanding of our target audiences. But in this situation, where a cross-functional group is acting as the primary decision maker, it’s of critical importance to understand the needs, challenges and motivations of each group member. Produce content for each role and each stage in the buying process. Because the tech decision maker is actually a group, the first engagement with a company could be with any one of its members. That’s why it’s imperative to have a strategy in place for how to reach, engage and ultimately convert every member of the group at each stage in the buying process. Remember, today’s tech decision makers consume a lot of content before ever even speaking to a sales rep. During this time, these individuals are advancing through the decision making process based on the information they consume. Tech marketers have the opportunity to influence these individuals and begin to win them over through always-on education— content that provides valuable, educational information at every stage of the buying process. When you consider that 63 percent of tech buyers are more likely to consider vendors that take this always-on approach,[ii] it’s worth the effort. According to the Content Marketing Institute, 93 percent of tech marketers are using content marketing. However, these same individuals have also consistently reported “creating engaging content” as a top challenge for the last five years. What this tells us is that while tech marketers see the value of content marketing and are committed to it, lack of time and resources often holds them back from creating engaging content. Tech marketers have to produce high-quality content that will stand out in a marketplace saturated with competition. What’s more, that content must be published quickly, before the message expires as the industry evolves. Develop a reliable toolbox. There are more content marketing tools and resources available today than ever before. Just one or two years ago, creating an infographic or eBook required a lengthy process complete with writers, designers, developers, and a few select pieces of complicated software. But today, there are numerous resources for marketers to conduct research, various user-friendly design tools to choose from, and a range of options for publishing and distributing content, including publishing on LinkedIn. Today, tech marketers are responsible for staying ahead of the rapidly changing world of technology and shaping messages to appeal to some of the brightest, most forward-thinking minds in the industry. Thankfully, through the help of some great tools and a solid content strategy, it’s possible. Also feeling the heat to prove content effectiveness? Then stay tuned for Part 2 in this series, highlighting your best tools for creating content with measurable ROI. In the meantime, you’ll love our post on Smart Targeting: Tech Marketing KPIs that Matter! 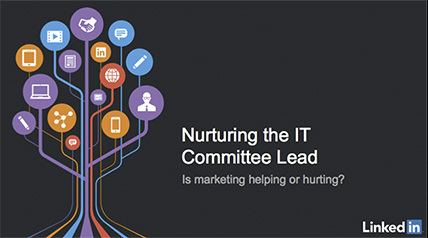 Learn how IT marketers can avoid common mistakes and build meaningful relationships by downloading our latest research: Nurturing the IT Committee Lead. [i] LinkedIn. Nurturing the IT Committee Lead. Is marketing helping or hurting?